Bhagavad Gita Art Gallery--Plate 37: The living entity in the material world carries his different conceptions of life as the air carries aromas.. The living entity in the material world carries his different conceptions of life as the air carries aromas. PREVIOUS Bhagavad-gita 15.8 Top section: On the left, a boy is dancing before the Deities of Radha-Krsna. 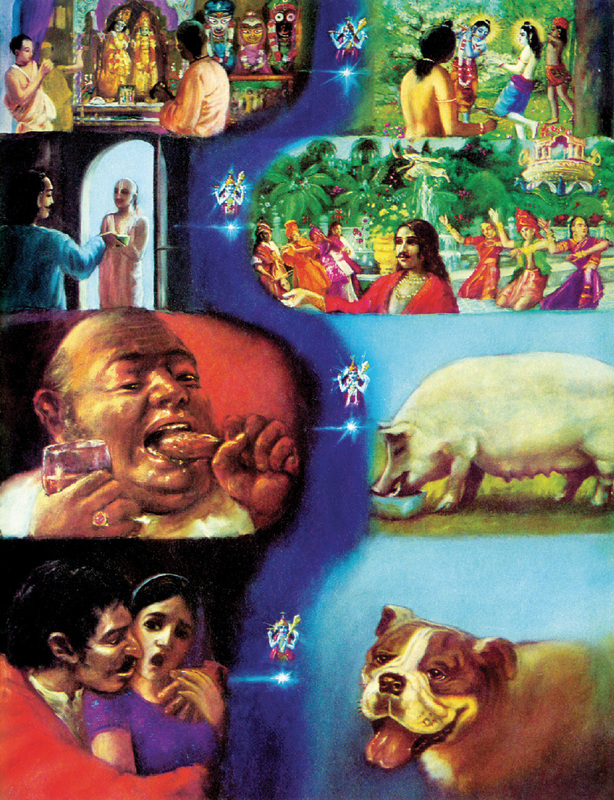 The result of such devotional consciousness is shown on the right, where he is dancing with Krsna as a playmate in the Lord's spiritual abode. Second section: On the left a man is offering charity to a brahmana; on the right he has taken the body of a demigod and is enjoying heavenly delights. Third section: A man is eating meat and other abominable foods; in his next life he is seen in the body of a hog who eats anything and everything. Bottom section: A man is approaching a women with lust. This bestial consciousness carries him to a dog's body.